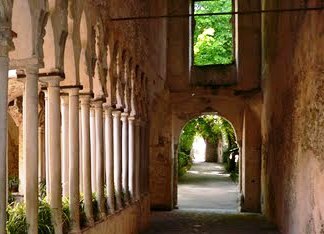 Beautiful Ravello sits peacefully in the hills behind Amalfi and Atrani. Atop the hill sits the historic town and the hillsides are covered in terraced gardens that are mainly lemon trees from which is produced the famous "Limoncello". The best way to have this delicious liquer is either straight on crushed ice or in champagne. The town tends to be quieter than others on the coast mainly because its one hell of a road to get there. Winding it's way up from Amalfi the road is very narrow and you have to be cautious and take your time. If you don't have a vehicle then you can get a taxi to take you but bear in mind that this may a bit pricey due to the road being slow going. The SITA bus service runs from Amalfi and is probably the best option. The bus departs down by the main beach in Amalfi. There are lots of good options for accommodation and a stay up in the hills is refreshing and peaceful. See our Hotels page if you need some ideas. This beautiful villa is well worth a look and the views from the "Terrace of Infinity" are exceptional. 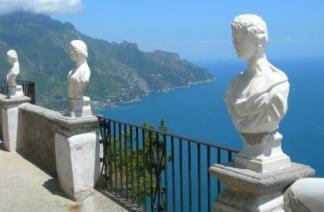 The Terrace of Infinity at Villa Cimbrone. You should also check out this Villa for its wonderful gardens and of course... more views. Check our picks for Hotels.